(Photo credit: Tom Casino/SHOWTIME) CABAZON, Calif. (Dec. 31, 2011) – Jermain Taylor and Andre Dirrell made triumphant returns to the ring Friday, both winning by knockout during a special edition of ShoBox: The New Generation on SHOWTIME®. Taylor (29-4-1, 18 KOs), of Little Rock, Ark., registered an eighth-round knockout over game but outclassed Jessie Nicklow (22-3-3, 8 KOs), of Baltimore, Md., in the main event at Morongo Casino Resort & Spa. Dirrell (20-1, 14 KOs), of Flint, Mich., scored two knockdowns en route a second-round knockout over Darryl Cunningham (24-3, 10 KOs), of Detroit, in the co-feature. Taylor was making his first start in 26 months; Dirrell his first in 21. In the opening bout of the telecast, former Cuban amateur standout Luis “El Leon” Garcia (12-0, 9 KOs) of Cork, Ireland, won his United States debut and dealt southpaw Alexander “The Great” Johnson (12-1, 5 KOs, 1 NC) of Oxon Hill, Md., his first defeat on a lopsided eight-round decision. Taylor, a former undisputed world middleweight champion, did not drop the much smaller Nicklow and he had a point deducted for a late hit after the bell sounded in the sixth. But Taylor, making his first start since Oct. 17, 2009, was in total command and well ahead on points (69-63 on all three scorecards after seven completed rounds) when the referee stopped the match 36 seconds into the eighth. Nicklow was adamant that he could have continued but the outcome had long been decided and he had taken a beating. Dirrell floored Cunningham two times in the second round before the bout was stopped at 2:05. Dirrell’s first knockdown came from a long left hand, the second from a short right hook. 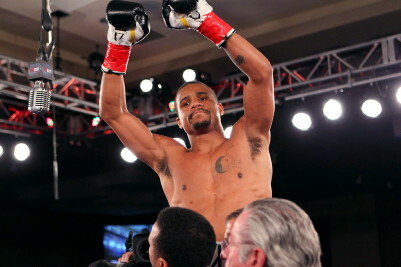 “I am just so happy to be back,’’ said Dirrell after this first fight since March 27, 2010. “I wanted it to go further, but I felt really good. My hands felt lighter, my feet felt fast. I’d say I fought at about 99.5 percent, which was more than I could ask for. “Time will tell what I do next, but I’m going to continue to work hard. There is such a small window. I’m 28 years old. I’m just going to continue to push forward. Garcia, who recently turned 24, is a boxer you may want to keep an eye on in 2012. Performing with poise, he thoroughly dismantled Johnson, winning every round, even though he, like Taylor and Dirrell, was coming off a lengthy layoff. Friday’s fights will be available ON DEMAND beginning Monday, Jan. 2. Upcoming in 2012: ShoBox returns next Friday, Jan. 6, during a Free Preview Weekend on SHOWTIME (11 p.m. ET/PT, delayed on the West Coast) with a doubleheader featuring lightweights. In the main event at Fantasy Springs Resort Casino at Indio, Calif., unbeaten southpaw Luis Ramos (20-0, nine KOs) of Santa Ana, Calif., faces Raymundo Beltran (25-5, 17 KOs) of Los Mochis, Mex. Undefeated prospects Michael “The Artist” Perez (15-0-1, 9 KO’s) of Newark, N.J., and Omar “Panterita” Figueroa Jr. (13-0-1, 10 KO’s) of Weslaco, Tex., clash in the co-feature. On Friday, Jan. 20, on ShoBox (11 p.m. ET/PT), World Boxing Association (WBA) super bantamweight champion Rico Ramos (20-0, 11 KOs), of Whittier, Calif., will defend against 2000 and 2004 Olympic Games gold medalist and WBA interim champion Guillermo Rigondeaux (8-0, 6 KOs), of Miami, Fla., by way of Cuba, at the Pearl at Palms Casino Resort in Las Vegas, Nev. In the main event on SHOWTIME CHAMPIONSHIP BOXING on Saturday, Feb. 11 (10 p.m. ET/PT), former world champions “Vicious” Victor Ortiz (29-3-2, 22 KO’s), of Ventura, Calif., and Andre Berto (28-1, 22 KO’s), of Winter Haven, Fla., will slug it out in a rematch of one of 2011’s most exciting and memorable fights at the MGM Grand Garden Arena in Las Vegas, Nev.